Why do you choose the organization? Would you work overtime if necessary? Why did you take up this career? What do you look for in your job? Would you like to enter management? Will you be able to work in this job for 5 years? How long have you been interested in this hobby? Are you attending any part-time job at present? Is there any course you wish to attend? You have an urgent piece of business after work but your employer asks to stay late. What will you do? What would you do? If you realize that your employer has left for an overseas business leaving some important documents. Entering into your room, you found your desk broken. What will you do? Etc. Please brief us your academic background shortly? What jobs have you held? How were they obtained and why did you have? What courses did you like best? Why? What qualification do you have that make you feel that you will be successful? What salary do you expect to receive for this job? How much money do you hope to earn at age 25, 35? Are you looking for a permanent and temporary job? Can you take instructions without felling upset? Do you like routine work? What is your major strength and weakness? What size city do you prefer? Will you fight to get ahead? 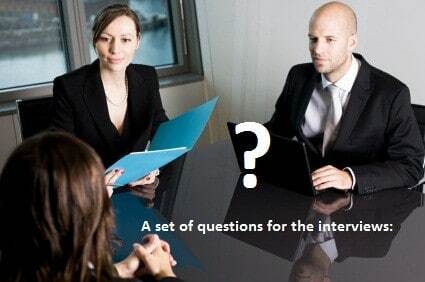 Moreover the employer asks the questions about word work experience, education and training, leadership, initiative, persistence, motivation and communication skills etc.